Dan Green has provided us with a book that details the U.S. special operations forces (SOF) participation in an innovative method to combat the insurgents in Afghanistan. The Village Stability Operations (VSO) and Afghan Local Police (ALP) were programs to energize local support for the Afghan national, provincial, and district government institutions in remote and inaccessible areas where conventional U.S., NATO, and Afghan security forces were scarcely distributed. The Village Stability Operations program was designed to work along three lines of effort – security, governance, and development. A big part of the VSO program was the establishment of a local police force called the Afghan Local Police. Special operations forces from the U.S. Army Special Forces, U.S. Navy SEALs, and U.S Marines (MARSOC) were embedded in villages, communities, or district centers to work the three lines of effort of VSO and to help establish and train the ALP. 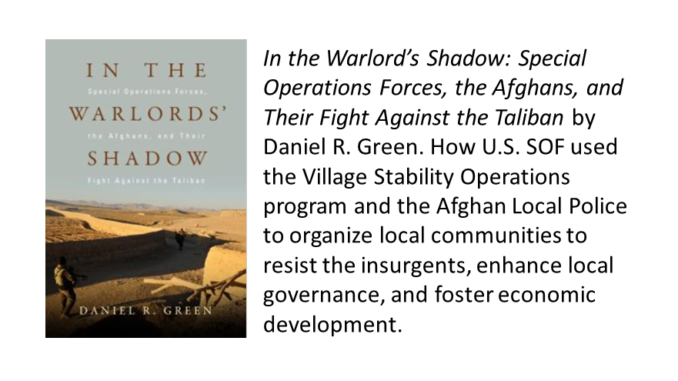 In his book, Dan Green provides a detailed history of how SOF was able to stabilize the southern Afghan province of Uruzgan. Dan Green is the author of two previous books – Fallujah Redux and The Valley’s Edge. Dan Green is a Defense Fellow at The Washington Institute for Near East Policy focusing on counter-terrorism, counter-insurgency, and stability operations in the Middle East and Central Asia. He is a reserve officer with the U.S. Navy with several deployments to Afghanistan and Iraq as both a Naval officer and various civilian agencies. His time in Afghanistan includes a stint as a tribal and political engagement officer in Uruzgan province (2012), as a ISAF Liaison Officer to the U.S. Embassy’s Office of Interagency Provincial Affairs in Afghanistan (2009-2010), and as a civilian with the State Department as the political advisor to the Tarin Kowt Provincial Reconstruction Team (PRT) in Uruzgan province (2005-2006). Dan Green has also served two tours in Iraq (2007) and (2015-2016). The book by Dan Green is now available on Amazon.com at the link below.